Megyn Kelly took on her former Fox News Channel colleague Bill O'Reilly in blunt terms on Monday, revealing she had gone to her bosses to complain about O'Reilly's behavior and saying the size of a newly revealed $32 million US settlement of harassment charges made by a Fox analyst was "jaw-dropping." O'Reilly responded, in part, by posting a copy of a thank you note Kelly had sent to him for a gift given at a baby shower. The New York Times reported that O'Reilly had agreed to the $32 million (all figures US) deal to set aside allegations that include a nonconsensual sexual relationship with former Fox analyst Lis Wiehl, bringing to six the number of harassment settlements involving him. The deal was reached a month before O'Reilly signed a contract extension and three months before O'Reilly was fired because of publicity about the cases against him. O'Reilly has said he's done nothing wrong. More than just an embarrassment that Fox had hoped was in its rear-view mirror, the story could have costly consequences. Fox's parent company, 21st Century Fox, is awaiting a decision by British regulators regarding its purchase of the Sky satellite television company, and the issue of Fox News' management is being considered. Kelly, on her NBC show Monday, refuted O'Reilly's claims that no one had complained about him, saying Fox "was not exactly a friendly environment" for women who had stories to tell about abuse. She said she went to Fox leaders Bill Shine, who has since resigned, and Jack Abernethy, who is now president of Fox News Network, after her memoir was published last November with her anger about O'Reilly's suggestion that people who complained about their treatment at Fox were disloyal. Kelly had written in her book about alleged harassment by Fox's one-time leader Roger Ailes. "Perhaps he didn't realize the kind of message his criticism sends to young women across the country about how men continue to view the issue of speaking out about sexual harassment," Kelly said she wrote to her bosses. O'Reilly's attitude of "shaming women into shutting the hell up about harassment on the grounds that it will disgrace the company" is precisely how Fox got into the mess it was in, she said. Later Monday, she posted a copy of the email she sent to her bosses. "You've got a hell of a guy hosting that 8 p.m. hour," she wrote. 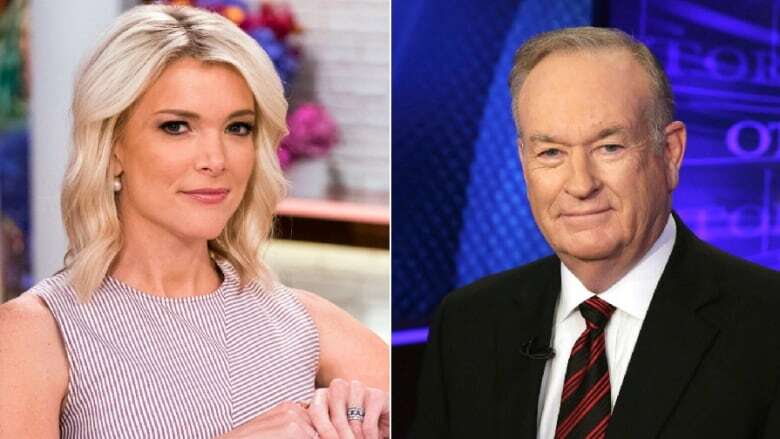 Kelly said she was told O'Reilly would be spoken to and, hours later, he said on the air that people who don't like what is happening in the workplace should leave or go to human resources. She said it's clearly not just Fox that handles the issue of harassment badly. "This must stop," she said. "The abuse of women, the shaming of them, the threats, the retaliation, the silence of them after the fact — it has to stop." O'Reilly and Kelly's shows once ran back-to-back on Fox's prime lineup. Now those time slots are filled by Tucker Carlson and Sean Hannity. O'Reilly, speaking Monday on the radio program hosted by another ex-Fox colleague, Glenn Beck, said he found Kelly's comment incomprehensible. "I don't know why Megyn Kelly is doing what she's doing," he said. "I helped her dramatically in her career." His website posted notes penned to O'Reilly by Kelly in 2009 and 2012. In one, she thanks O'Reilly for publicizing a book written by her husband. In the other, she thanks him for the "darling body suit and snuggly" given at a baby shower. "You've become a dear friend (no matter what you say) and I'm grateful to have you in my life," she wrote in the note. O'Reilly also posted a note from Gretchen Carlson, whose lawsuit against Ailes led to his downfall. She's been critical of O'Reilly, and of Fox allowing Hannity to bring him back on the air for an interview recently. In the undated note to O'Reilly, she wrote, "thank you for being my friend." Carlson's response on Twitter to the note: "So what. Still paid $32M." "If you still want to think I'm a bad guy, go ahead," O'Reilly told Beck. He said the Times' story about the Wiehl case was designed to get keep him out of the marketplace. "This is an attack on an American citizen, me, for political purposes," he said. "It has done enormous damage to me and my family. It is a horror show and should never happen in this country." On her show, Kelly said she's still being victimized by Fox. She said Fox's powerful public relations chief Irena Briganti is "known for her vindictiveness" and "to this day, she pushes negative articles on certain Ailes accusers, like the one you are looking at right now." Briganti was not at work Monday. 21st Century Fox issued a statement saying Briganti was "a valued colleague and she has our full support." Kelly also interviewed former Fox anchor Juliet Huddy on her show. Huddy, who appeared with her lawyer Doug Wigdor, also settled harassment claims against O'Reilly, and said she wrestled with the idea of signing non-disclosure agreements. The one she signed prevented Huddy from giving any details about her case against O'Reilly. She said she struggled with the concept, knowing that it would help other women who feel abused if they knew there were others out there like them. Huddy said she still isn't working in the broadcast business after leaving Fox.